Part of the nature of corrective markets is that they do not so much as scare you out as they do wear you out with choppy action and a vast array of head-fakes along the way. And on this midterm election Tuesday, bulls are turning in a decent effort this morning in the Nasdaq to try to reignite some momentum growth plays, albeit with the QQQ ETF well off session highs as I write this. Should we flip back red today, I suspect it will simply reinforce the notion that the market is far from out of the woods, even if the uncertainty regarding the elections abates by tomorrow. Still, one cannot help but notice some names like FIT and TWTR, both of which have surprising improved during this autumn correction via recent earnings rallies. 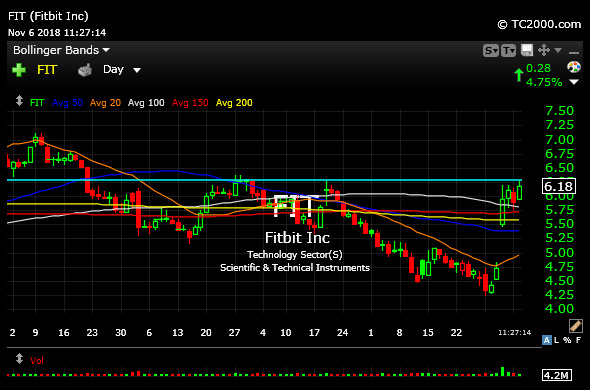 On the FIT daily chart, below, a move back over $6.30 should help sustain another squeeze in the improving Fitbit, which is also still a viable buyout target. Of course, follow-through higher in the Nasdaq would make this idea much more viable from a practical standpoint in terms of undermining the head-faking nature of corrective markets.